I can think of three reasons why introductions need to be looked at. First one would be that the character is important, but doesn’t make enough of a first impression. The reader’s not going to get involved with a character if he/she forgets the character within a few paragraphs of getting introduced. So let your character’s inner stars shine from the start. Or at least a little bit to entice the reader. Then there’s the fact that a character wasn’t really defined when you wrote him/her at first. It’s perfectly natural, because it takes time to get to know a new character. Time that can only be taken by writing the story. Also, in the process of writing a draft, you’ll very possibly find that the character veers off in another direction as the story goes. Because of that, the original introduction and who you discover the character to be, won’t coincide. So when it’s time to look at your characters’ introductions: look for traits that you want the reader to know from the start. Does the introduction of every character show those traits in a way that imprints the character in the reader’s thoughts? If not, you’ll have to rewrite the scene to create the impression you wanted. 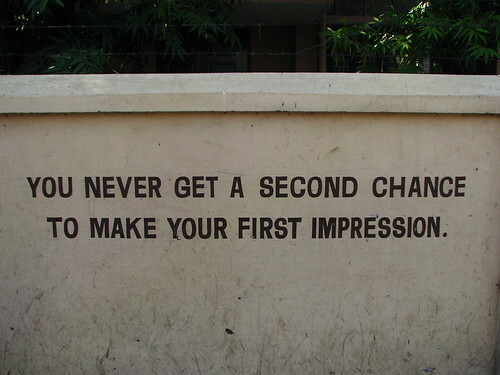 There’s only one chance to create a first impression for a character. Make it count. 1) The character seeming like different people between the first and later parts of the story. 2) An introduction that isn’t memorable, despite the fact that the character is supposed to be. 3) Readers not engaging with an important character, or failing to remember that they’ve been introduced. What do you do to get the introduction of your characters just right? My name is Misha Gericke and I am finishing my B.comm at the University of Stellenbosch. To be honest I’m only doing the degree to make my parents happy and having something to fall back on, so as of next year, I want to start living my life to the full. Who knows? Maybe I’ll tell you about it in future. My grandmother has written for a living for as long as I can remember, which I guess is why I think of writing as a viable career option. Still, I have never decided to write full time. Instead I retreat to my book and pen to save my sanity. I must say that I become intolerable when I don’t write often. I become more so when I suffer from writer’s block. Be warned that I have been suffering for about two months now. So if I seem to be rampaging down Victoria Street, RUN!!! I’ve always wanted to start blogging, but never had an idea what I would blog about. Eventually, the idea formed that I should start writing about my first really serious attempt to write with a view to publishing. I just thought that it might be a good idea, since there must be many aspiring writers out there that must feel as lost as I do some times. Don’t worry though… I won’t spoil the book and maybe will leave only tasters to whet your appetite, since I absolutely hate people who spoil endings.